With its 115,000 m2 of facilities, BRUSSELS EXPO is Belgium’s largest Exhibition Centre and hosts trade shows, congresses, fairs as well as professional and public events. It reflects the enthusiasm and energy of the capital of Europe. Located on the Heysel Plateau, P12 hosts major events, such as large-scale concerts, conferences, shows and major sporting events for a maximum capacity of 18.000 people. With a seating capacity ranging from 2.500 to 15.000 persons, P12 sets the tone and lays down its hat at the very heart of Brussels Expo, which allows it to enjoy a vast set of facilities. P12 does not shy from its ambition. Its simple, pure and flexible design makes it usable for many types of events. In around 100 days per year, the hall will welcome 1,5 million visitors. Concerts of national and international artists, family shows, entertainment, and trade fairs, sporting events… P12 is already the essential stop for concert and events organizers. 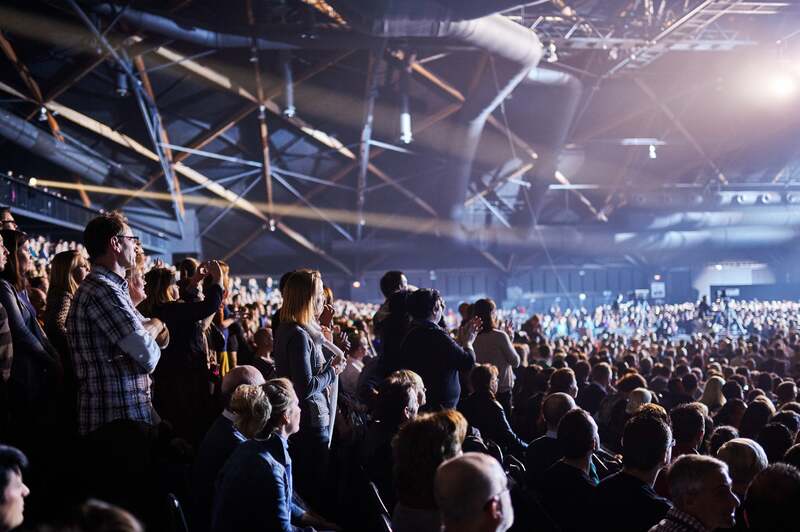 As the many large events organized at Brussels Expo demonstrate and thanks to its central position and accessibility, P12 is the only venue in Belgium capable of welcoming spectators from all across the country with a potential of more than 11 million people. This is a huge asset for P12, Belgium’s only venue to boast such a high prospect of spectators. The Heysel is the place to be for great national events. It welcomes all the linguistic communities of the country for such key events as the Brussels Motor Show (Salon de l’Auto), Batibouw, exhibitions (Tutankhamun, Titanic, etc.) and international football games. Visitors of “the plateau” truly reflect Belgium’s population as a whole. Indeed, Brussels Expo has always been a second home to Belgians. The national vocation of P12 is not a marketing argument, but a venue substantiated by the most important history of major events in Belgium. At first glance, the P12’s singular aesthetic and industrial appearance strikes the eye, revealing a classy, intimate and warm character with its head-on facing stage, commanding technical platform and arched roof that subtly blends natural wood and black steel. The ambition of the venue does not end there. Optimal public transport connections link such cities as Paris, Lille, Cologne or London to Brussels in less than two hours. Proximity to the national airport will also attract a wider European audience in search of a large, welcoming venue offering a perfect acoustic.